Ed Miliband is accused of having a ‘35% strategy’, meaning that he is banking on doing only just enough to win an overall majority at the next general election. Polling models suggest that 35% would be enough for Labour to achieve an overall majority in Parliamentary seats. This is because the Tory vote is increasingly concentrated, while Labour’s is far more widely spread geographically. Since Labour’s electoral strategy has not been divulged to SEB, it is idle to speculate on it, although this has not prevented others from doing so. Instead, it is possible to demonstrate that the Tory policy is based on an electoral strategy that is focused on an even narrower section of the electorate. It is the Tories who have a 30% electoral strategy. 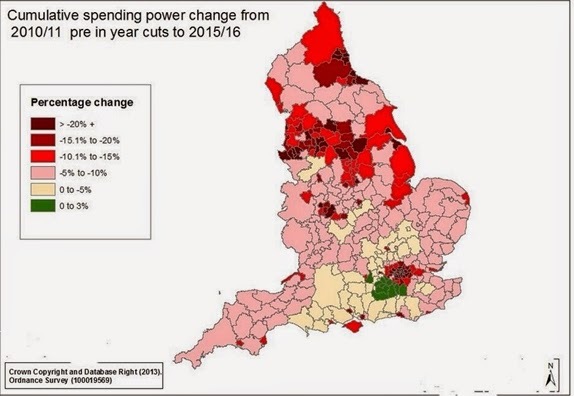 The map below (which the present author first saw published by Ian Wright MP) shows the cumulative effect in English constituencies of cuts under the Coalition government during this parliament. The Tory Party is a fringe grouping in Scotland and is headed in that direction in Wales. Despite repeated attempts it has also failed to resurrect Conservative Unionism in Ireland. The areas in beige have been barely affected by government cuts (although these are averages, there will be many people living in those areas who are badly affected by austerity). The areas in green have experienced no net cuts at all. By contrast, areas coloured in red have seen a fall in living standards of between 15% and 20%. Those areas coloured deepest red have seen falls of greater than 20% and take in all the large cities, including London. The economic map almost precisely coincides with the electoral map of Britain. The Economist and others are keen to argue that this is a North-South divide in British politics. To that end, they are obliged to perform some logical contortions. In order to make the main divide in British politics North versus South, The Economist excludes the Midlands from the North and excludes London from the South! In reality, the Tory Party has been forced out of Ireland, Scotland, the cities, Wales and the North in succession. It is retreating to its birth place and stronghold in the English shires. The economic response of the Coalition government led by the Tories is to protect and promote those Tory heartlands, as shown in Chart 1 above. SEB has previously shown how a minority of society, the owners of capital and the rich, are benefitting from the ‘recovery’ in which most people’s living standards continue to fall. Perhaps the most flagrant policy in this regard is Osborne’s ‘Help to Buy Scheme’. The entire policy of increasing demand for housing while doing nothing to increase supply inevitably leads to higher prices. A number of commentators and economists from the Right have attacked the scheme as an absurd policy, designed solely to boost property prices rather than housing availability. It is a ‘help to get re-elected’ scheme. The resulting property price bubble is concentrated in London and the South-East, and even here there is growing resentment at the unaffordability of housing, not a feel-good factor. Politically and economically, the Tories are pursuing a core vote strategy. This may not amount to much more than 30% at the next general election, and will certainly be less than the 36.9% they received in 2010. As a result, support for the LibDems has collapsed as this does not at all coincide with the interests of their electoral base, higher-paid workers, professional classes and small business owners. Labour’s winning electoral strategy should be equally clear and substantially broader. In terms of political geography it should embrace the democratic demands for greater national rights within the British state, as well as finally ending the British presence in Ireland. It needs to have a programme of economic regeneration for the North and the big cities. It should adopt a very large scale programme of council house building with London at its centre-piece. Socially, it needs to be a champion of equality and democracy, tackling the huge inequalities faced by women and tackling the endemic racism of British society, which cannot be done while promising to be tough on immigration. Above all now, it needs to reverse the policy of austerity which is lowering the living standards of the overwhelming majority and will continue to do so. The Tory policy, of government spending cuts and inducements to the private sector to invest has not worked. A policy of government-led investment is required, combined with other policies that will directly lift standards. The Tory party is pursuing a narrow electoral strategy to shore up its support. Labour can offer something better. This entry was posted in Economics, Education, Employment, Gender, Government policy, Health, Housing, Local government, Privatisation and tagged 35% strategy, Coalition, Conservatives, Core vote strategy, Electoral Strategy, Geographical spread of cuts, Labour, Liberal Democrats, Michael Burke, north-south divide, Socialist economic bulletin by syzygysue. Bookmark the permalink.